Whether you like or hate Donald Trump, you have to admit that his actions have gotten him into the White House. Yet you have to wonder why Donald Trump behaves the way he does. He always wants his way, he doesn’t listen to others, and he always thinks he’s right. If you spotted this blustery behavior in a child, you might wonder why a person would act like this and one possible reason is that it’s a way to cover up low self-esteem. Bullies are often easily intimidated. Because they’re essentially cowards, they overcompensate by acting far tougher than they feel. More importantly, bullies act tough to others because they’re afraid. They’re not afraid of others so much as they’re afraid that others will see them for who they really are. So they hide behind a false front that puts up a tough exterior right away as a shield. Of course, such a shield not only blocks out threats, but also blocks out love. Essentially, Donald Trump, like all people, wants to be liked. There are many ways to be liked, but if you have low self-esteem, you’ll be extremely sensitive to any sort of criticism. (Sound familiar with his constant Tweeting?) You’ll also pretend to be the opposite of how you really feel. Someone with low-self-esteem needs the adoration of others like a drug addict needs cocaine. People with low self-esteem need constant approval from others, but it’s never enough. They need more and they need it all the time. Someone who holds such a low opinion of himself must continue to draw attention to himself through emotional outbursts and outrageous actions because these give him attention in the same way that a crying baby tossing toys around a living room can attract the attention of the parents. Now most of the Hollywood crowd has turned against him and will never forgive his actions again. No matter what happens to his Presidency, Donald Trump will never be welcomed into the majority of Hollywood circles ever again, and that fact alone must particularly hurt someone like Donald Trump. Given the fact that he’s already shut himself off from Hollywood and many world leaders, who else can Donald Trump turn to for unending approval? His base of white nationalists. Expect Donald Trump to perform more outrageous acts like a screaming toddler throwing a tantrum for approval. As Donald Trump’s circle of friends gets smaller and smaller, he’ll get wilder and wilder, pandering to the only people who still like him: neo-Nazis, white supremacists and racists, and angry bigots. Not surprisingly, this group of people don’t embrace facts or care about history. All they care about is themselves, their imagined enemies and threats to their existence, and their own selfishness — exactly the same way Donald Trump feels. Donald Trump must continue seeking approval from right-wing extremists because they’re the only ones who like him while the rest of the world shuns him. For someone who only wanted to be liked, having a large percentage of the world actively and visibly protest against you must be the ultimate fear of anyone with low self-esteem. Most people who hold low opinions of themselves only have to deal with a handful of people who don’t like them. Donald Trump has to live in the fish bowl transparent bubble of the whole world, and a growing percentage of the world does not like him. For someone with low self-esteem, being President isn’t a dream job. It’s Donald Trump’s biggest nightmare. There’s no question that Fidel Castro was a dictator and no question that he overthrew another government to become Cuba’s dictator. However, if you do a little research into history, you’ll realize many Cuban Americans’ parents lived in Cuba under another dictator named Fulgencio Batista. According to Wikipedia, Batista ran for president in 1952. Facing certain electoral defeat, he led a military coup. With financial and military support from the United States government, Batista suspended the 1940 Constitution and revoked most political liberties, including the right to strike. He then aligned with the wealthiest landowners who owned the largest sugar plantations, and his policies helped widen the gap between rich and poor Cubans. Eventually it reached the point where most of the sugar industry was in U.S. hands, and foreigners owned 70% of the arable land. Batista’s increasingly corrupt and repressive government then began to systematically profit from the exploitation of Cuba’s commercial interests, by negotiating lucrative relationships with both the American Mafia, who controlled the drug, gambling, and prostitution businesses in Havana, and with large U.S.-based multinational companies who were awarded lucrative contracts. Batista essentially was a dictator who exploited Cuba at the expense of the common people. 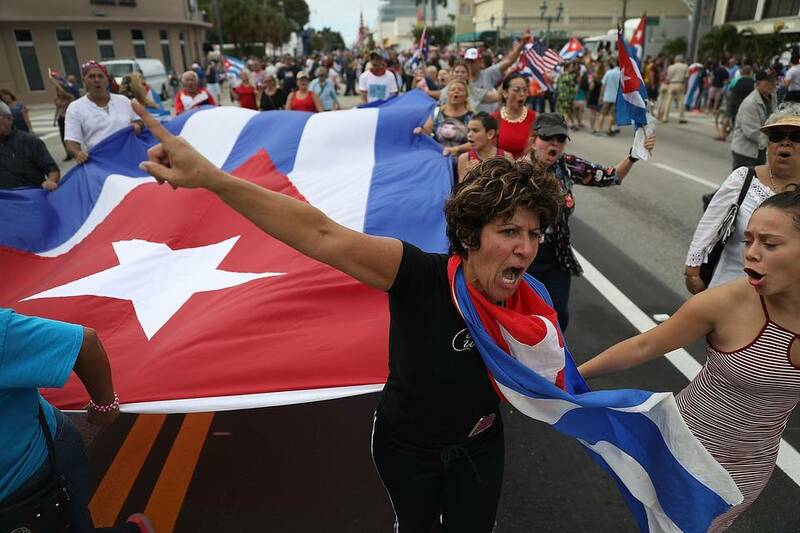 So when you see Cuban Americans dancing in the street to celebrate the death of Fidel Castro, the big question is did the parents of these Cuban Americans also celebrate the overthrow of Fulgencio Batista since he was also a dictator? If not, why not? If the goal is to free Cuba of a dictator, then how come the American government seemingly supported Batista, who was a dictator? Did they support him because he was friendly to American financial interests and ignore his oppressive regime against his own people? If so, then how come American newspapers don’t report this information as part of the story covering Cuban-Americans celebrating the death of Fidel Castro? By just taking a little time to research history, you can suddenly see that the hatred for Fidel Castro isn’t just because he was a dictator but likely because he wasn’t friendly to the financial interests of the people profiting off the exploitation of the common people regardless of whether a dictator was running Cuba or not. There’s no question that Batista was a dictator just like Fidel Castro was a dictator. So why is Fidel Castro hated and Fulgencio Batista is not? Could it be that financial interests are more important than democracy and the well-being of the common people? To read a Wall Street Journal article about Castro’s death that conveniently ignores any question about Batista’s equally repressive dictatorship over Cuba, click here. If you listen to conservatives, the real solution to all of our problems is to return back to God. By that they mean their God and their way of worshipping their God. The general consensus is that we’re all going straight to hell unless we follow the rules of God, which basically means always doing good and never getting tempted into evil. If you get tempted into evil, you risk facing God’s wrath and being punished in the afterlife by getting sent straight to hell. So there are two flaws with someone’s desire to get into heaven. First, getting yourself into heaven is basically a selfish act. You want to save yourself because you think you deserve it, yet a truly unselfish, Christian act would be to give up your place in heaven so someone else can have it instead. I guess you won’t see too many religious people embracing that idea. However, a more serious obstacle to getting into heaven is the so-called belief that you must be 100% good all the time and if you stray from the righteous path, you risk going straight to hell. Using that logic, it seems like the fastest and most direct way to hell would be to worship not God, but the devil. If you become a devil-worshipper, now you must be evil 100% of the time so you can go straight to hell. However, if you do a few good acts in your life, you’ll risk having Satan punish you by sending you straight to heaven. See how easy that path to heaven can be? With a God-fearing approach, you have to be good most of the time. With a Satan-worshipping approach, you just have to be good some of the time. Then Satan will punish you in the afterlife by denying you from hell and sending you straight to heaven instead. So the quickest path to heaven seems to be embracing evil and doing good once in a while — which is exactly what most extreme right-wing (and left-wing) people actually do. Of course, if those people are going straight to heaven, then it’s far more likely that heaven is really hell, so you really want to go to hell so you won’t have to ever see those people ever again for the rest of your life. After all, it’s bad enough sharing your life with so many self-righteous people who use religion as an excuse to justify everything from slavery to war, but how would you like to spend an eternity with these same people? That’s the definition of hell right there, spending an eternity with self-righteous people. If given a choice, maybe hell doesn’t sound so bad after all. After Donald Trump announced he wanted to build a wall to keep out Mexican immigrants, do a mass deportation of all illegal immigrants, and ban Muslims from entering the United States, many people started comparing Trump to Adolf Hitler. Strangely, many Rabbis have come out to say that making comparisons of Trump to Hitler is wrong because it diminishes the real tragedy of the Holocaust and the six million Jews who died. When you read the arguments against comparing Trump to Hitler, you realize that these rabbis aren’t defending Trump so much as they’re protecting the memory of the Holocaust. These rabbis argue that Trump is different from Hitler because Hitler committed genocide against the Jews while Trump has simply talked about deporting illegal immigrants and banning Muslims. So these rabbis are correct in saying that Trump is not Hitler because Trump has not yet rounded up masses of people and exterminated them in concentration camps. Then again in the early days before he came into power, Adolf Hitler didn’t do that either. Hitler only committed mass atrocities against people once he became the leader of Germany while Trump has not yet had the chance to become the leader of the United States. With that in mind, the arguments against comparing Trump to Hitler could also be used to defend Hitler in his younger days from Hitler after he came to power. After all, before he became Chancellor of Germany, Hitler also didn’t round up Jews and exterminate them. He simply blamed all of Germany’s problems on Jews and encouraged violence against them. The main argument rabbis are using to avoid comparing Trump to Hitler is that Hitler committed atrocities but Trump has not. So if Trump is not Hitler in his later days, perhaps it’s more accurate to compare Trump to Hitler during Hitler’s early days. In the early days, Hitler blamed a group of people (Jews) for all the problems of the nation. 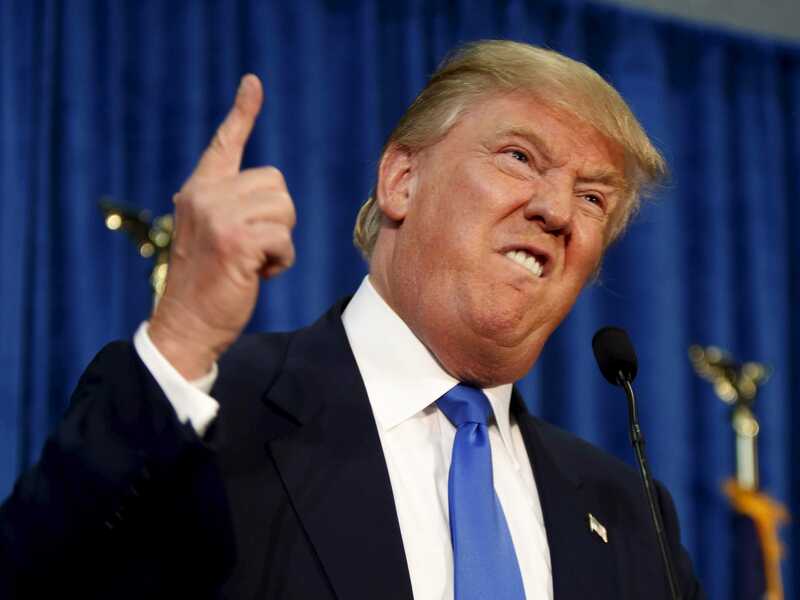 Today, Trump blames two groups of people (Mexicans and Muslims) for all the problems of the nation. In the early days, Hitler said he would make the country great again by making it a stronger world military power. Today, Trump says he will make the country great again by making it a stronger world military power. In the early days, Hitler roused people’s emotions by promising simple solutions (take over more land) to complex problems (the consequences of the Treaty of Versailles). Today, Trump rouses people’s emotions by promising promising simple solutions (build a wall) to complex problems (illegal immigration). So in many ways, Trump is not the Hitler who committed atrocities and genocide, but perhaps Trump really is much closer to the Hitler of the early days before he committed atrocities and genocide. Maybe the comparison of Trump to Hitler isn’t to diminish the Holocaust but to warn people that Trump is so close to Hitler during his early days that if we allow Trump to go unchecked, he could turn into the Hitler of the later days because he’s already so close to Hitler during the early days. If the arguments of rabbis defending Trump from comparisons of Hitler are valid, then those same arguments could have been equally valid in defending Hitler during the early days. After all, Hitler in the early 1930’s hadn’t killed any Jews yet; he simply advocated blaming them for everything. So if these rabbis dismissing Trump comparisons to Hitler were around in Germany during the 1930’s, would they have advocated people to stop comparing Hitler in his early days with Hitler in his later days? The main reason people are comparing Trump to Hitler is to warn people that Trump is too closely following Hitler’s actions before Hitler committed atrocities. The point is to keep Trump out of office so he won’t have a chance to commit atrocities like Hitler did. Perhaps Trump won’t commit atrocities like Hitler did, but do you really want to take that chance, knowing that Trump is far too similar to Hitler in Hitler’s early days? Comparing Trump to Hitler isn’t meant to diminish the Holocaust in any way. It’s meant to warn people that there’s a new person capable of creating a new horror to the world because he’s closely following Hitler in the early days. It’s fine for rabbis to say that Trump isn’t Hitler because there was only one Hitler and there will never be another Hitler. However, there can be people who may be similar to Hitler (or possibly even worse), supported by rabid followers who believe in violence to solving problems. Do you want to take a chance on putting someone like that in power? Trump is not Hitler. He could be even worse. If that happens, people could then compare Hitler to Donald Trump.